Fisherman’s knot, also known as English knot, consists of two overhand knots each one tied around the standing part of the other one. Though it is mainly used as a bend to join two lines, it can be easily used to connect the ends of a single length of rope to form a loop. The beauty of the knot lies in its symmetry. Start making the knot after bringing the ends of 2 lines to overlap each other parallely. It is good for tying on small diameter twines and strings, especially fishing lines. 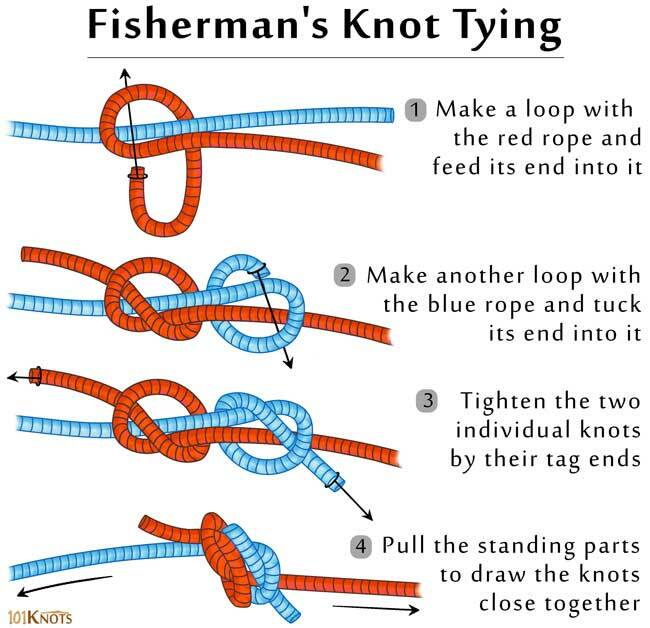 Double fisherman’s knot – Instead of employing overhand knots, it uses a couple of double overhand knots in their strangle knot forms. Stronger. True lover’s knot – Though tied on the same principle basically, the overlapping of the overhand knots is a bit different. Due to almost similar structure, sometimes used as an alternative name of the fisherman’s knot itself. Jams when tightened (However, this is advantageous for fishing purposes). Difficulty in untying makes it differ from the sheet bend. Rock climbing and by arborists. Backing up other less secure knots. Making macramé jewelry, paracord bracelets and keychains. In knot-tying ceremonies of weddings to symbolize how bonds grow stronger under strain. Blood knot – Provides superior performance while fishing. In picture number 2 it does not show the blue rope wrapped correctly. Thanks for pointing it out. The image has been corrected.